Test and Measurement Products for Industrial Research | TMetrix Inc.
Our test and measurement products for the industrial and natural resources sectors are second to none. 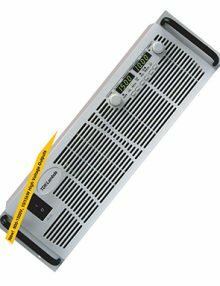 Precision-regulated Bi-Polar output provides up to +12 to -12 Amps for Magnet loads. 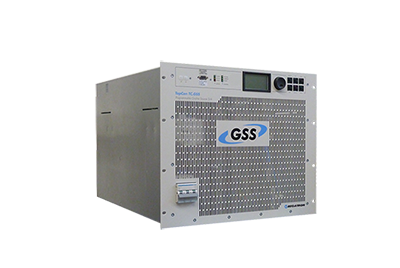 Smooth operation through zero amps output current, no “Crossover” problems. 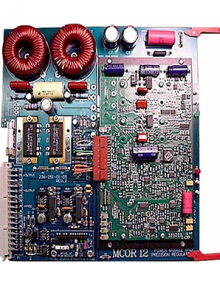 All 2510 MCOR12 Power Modules are identical and interchangeable. 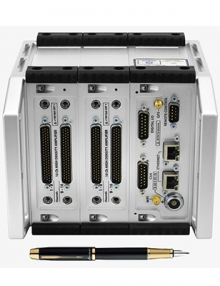 provides an independent monitoring signal to the Crate Interface Card. Fault sensing circuitry in the module sets a Fault Latch which inhibits the output. this eliminate switching noise . 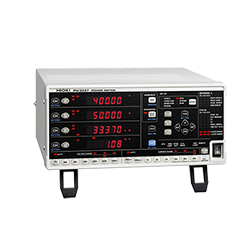 reduces power line noise during sensitive analog signal measurements. 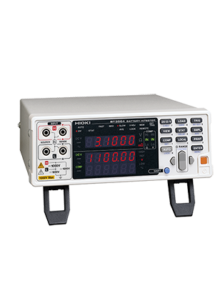 Precision-regulated Bi-Polar output provides up to +30 to -30 Amps for Magnet loads. Programming Card is plugged into the replacement module. 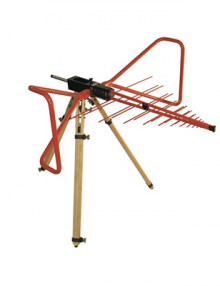 Each channel has a critically-damped, LC noise filter with a cut-off frequency of about 8 kHz. Wide AC Input Voltage range for three-phase 208VAC, 400VAC and 480VAC Input. High Power Factor (0.88 for Vout < 600V; 0.93 for Vout > 600V). Built-In Protective functions (OVP, UVL, FOLD, OTP, AC-FAIL). Output Isolation to 600V for Vout < 600V; to 1500V for Vout > 600V. High Efficiency ( > 77% for Vout < 30V, > 88% for 30V < Vout < 600V, > 93.5% for Vout > 600V). 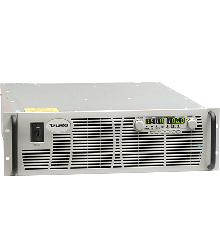 Rack-mount with provision for chassis slides; Zero-stacking for maximum power density. 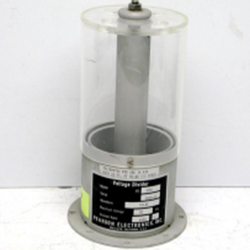 Cooling Fan speed control (for reduced audible noise and longer life): Vout > 30V. Light weight: < 97lbs (43kg) for Vout < 600V / < 70lbs (32kg) for Vout > 600V. 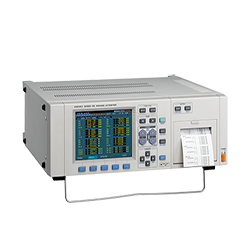 Fast Up/Down Programming Response Time (100ms/50ms for Vout < 600V, 17ms / 20ms for Vout > 600V). 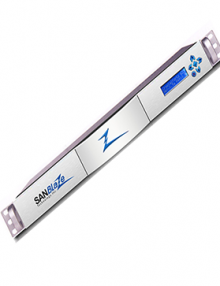 The VirtuaLUN provides full control and programmability of Fibre Channel parameters, allocating unique storage test conditions for SAN testing and development. 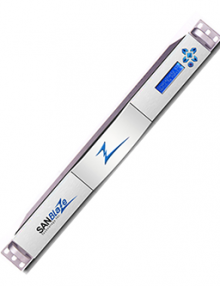 SANBlaze VirtuaLUN storage emulation for FCoE is the key piece of test equipment for anyone developing products supporting the FCoE storage protocol. The VirtuaLUN feature set provides a unique set of functions applicable in all aspects of a product life cycle: from development to design validation and test and QA. Verify changes in power, frequency and timing as a mobile station enters the network by visually tracking requests and responses. Analyze UL allocations to detect errors and identify resulting bursts sent in incorrect frame locations. Examine the behavior of the BS and MS during MIMO handovers. Track complete protocol exchange of multiple MSs with BS. Reveal timing offset violations by viewing the position of MS messages relative to the allocation start time assigned by the BS. Identify subchannels and sub carriers used for each slot within a protocol message to determine proper zone permutation assignments. Visually locate BS scheduling errors through advanced logical views of DL/UL assignments. 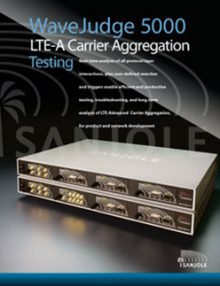 LTE Advanced brings increased network efficiency and higher throughput, but Carrier Aggregation is the key to meeting global expectations for mobile broadband performance. It does so by allowing service providers to consolidate multiple component carriers and use the bandwidth as a single medium between the user equipment (UE) and an evolved NodeB (eNB). 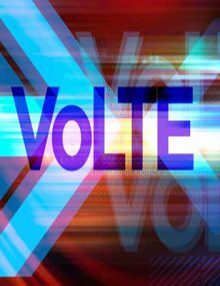 LTE CA gives carriers with fragmented spectrum the flexibility to offer 4G performance to subscribers. It has the ability to test in the middle, not at the ends, means you do not have to modify the system to fit the test tool. Not only does this improve ease of testing, it avoids disruption to the system that can change or influence the very behavior you are trying to troubleshoot. You get more reliable results and fewer troubleshooting dead ends. 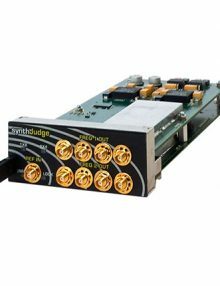 SynthJudge (OCXO Module) / Dual-frequency, from 380 MHz to 6 GHz, is particularly useful when developing systems for multiple markets. Leverage your testing investment to cover multiple spectrum bands. 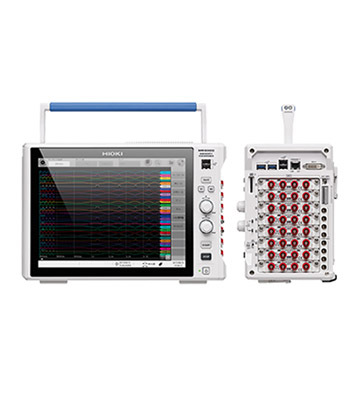 RXJudge modules feature superior sensitivity and dynamic range enabling you to test in the lab and in the field. 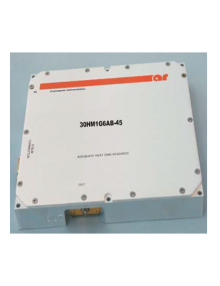 Each module features four independent, configurable 40 MHz receivers. 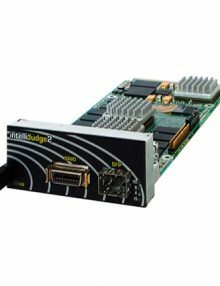 The WaveJudge 5000’s modular system provides a selection of modules (cards) that can be installed in or removed from chassis slots as your application requires. This modularity give you the ultimate flexibility in customizing a test solution targeted to your specific situation. 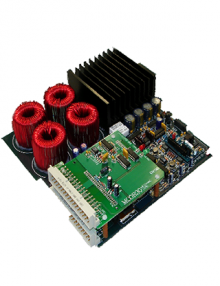 3-Channel AC/DC Power Meter for Single-Phase to 3P4W Equipment such as Motors, Inverters, Power Conditioners, and Power Supplies. 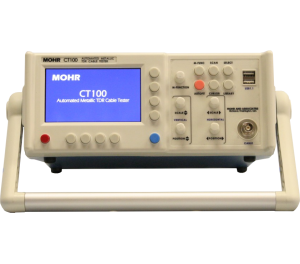 Higher-bandwidth version of the CT100S featuring the fastest TDR system risetime, ideal for testing high-frequency cables and interconnects with resolution and precision previously restricted to unwieldly bench-top TDR instruments. CT100 TDR configured with SMA test port assembly. Represents a balance of performance and electrical overstress protection for field applications where SMA test port is desired. Electrically-rugged, multipurpose metallic TDR designed for high-resolution testing of a wide range of coaxial and twisted-pair cable types and lengths — in the field, on the manufacturing floor, or in the lab. 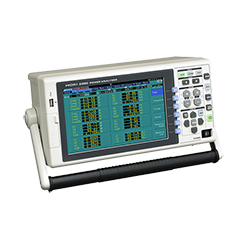 Exceeds all Tektronix® 1502C TDR specifications. 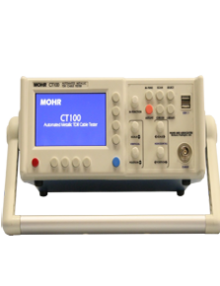 The new CT100 and CT100HF are the industry’s highest-resolution portable metallic TDRs, designed for testing all coaxial and twisted-pair cables and interconnects used in modern microwave/RF and digital systems. 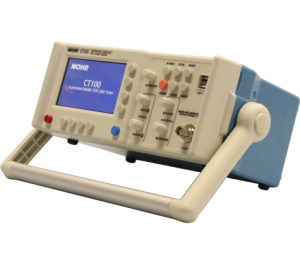 These are the only portable instruments that exceed all TDR specifications of the Tektronix® 1502C Metallic TDR Cable Tester, while providing next-generation improvements in TDR analysis, data storage, connectivity, and ergonomics. 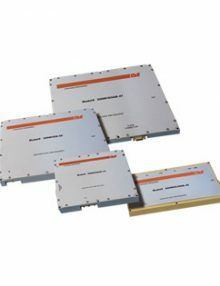 CT100 Series TDRs feature 8-10x sharper spatial resolution and100-1000x better Distance-to-Fault (DTF) resolution than competing TDR instruments, and have multi-GHz bandwidth similar to competing FDR (Frequency-Domain Reflectometer) instruments with similar or better cable fault sensitivity andorders-of-magnitude better DTF precision. 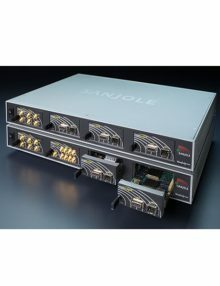 These instruments’ unique combination of fast system rise-time,high-resolution time-base, and precision 16-bit impedance measurements allow you to identify and correct subtle changes in cable and connector performance before system failure. Some of the CT100 Series’ innovative features are described below. 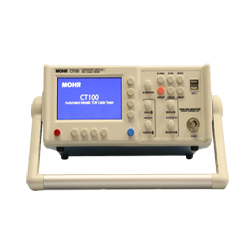 Also, please read CT100 Series Features for more information.